Metro’s contemporary design, durability, craftsmanship, and precision, make it a great choice for a billiard club or the home. Brushed aluminum accents enhance the look. Matching rack holds eight cues. Note: These cloth options are available on most pool tables. Other manufacturers (Brunswick, Olhausen, etc.) will have other cloth options. 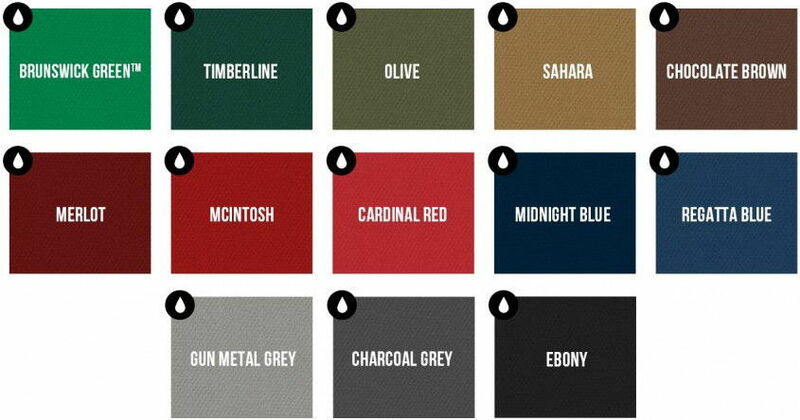 Refer to each pool table individually to see specific cloth options. Image colors and brightness levels may vary from computer to computer. We optimized these images as best as possible to represent actual colors. Triangle Billiards is not responsible for slight color variations in cloth. All our tables include deluxe felt pool table cloth in a variety of colors at no extra cost. Image colors and brightness levels may vary from computer to computer. We optimized these images as best as possible to represent actual colors. Triangle Billiards is not responsible for slight color variations in cloth. Similar to deluxe cloth, but bathed in Dupont Teflon. This process creates a fabric more resistant to liquids & stains. 20 ounce blend (75% wool, 25% nylon). Image colors and brightness levels may vary from computer to computer. We optimized these images as best as possible to represent actual colors. Triangle Billiards is not responsible for slight color variations in cloth. While enjoying a game of billiards with your family or friends, the last thing you want to worry about is spilling a drink on the table and staining the cloth. Brunswick Billiards has recognized this concern and launched its own stain-resistant Centennial© Cloth to help protect any billiards table from these mishaps. Centennial© Cloth is woven with worsted wool embedded with Stain-Resistant Dupont™ Teflon© Fabric Protector that safeguards the cloth and table from occasional spills. It helps minimize cue ball friction burns (the white spots), keeping the table looking brand new for years to come. Centennial Cloth does not pill or shed, maintaining a clean, sleek, playing surface. Expert players can be assured optimal speed is achieved in the production of Centennial Cloth through a pressurized vacuum decating process. The process allows the cloth to be thicker, 25 ounces of fabric per square yard versus the standard 19 ounces, while still providing both durability and speed. Centennial Cloth lasts up to 60 percent longer than competitive cloth, allowing consumers and pool rooms to change their cloth less frequently, saving them time and money. Brunswick Centennial© Cloth is available in 13 colors to reflect the style of each individual home or billiards room, and offers lasting durability, professional performance and refined style that you expect from Brunswick Billiards. Image colors and brightness levels may vary from computer to computer. We optimized these images as best as possible to represent actual colors. Triangle Billiards is not responsible for slight color variations in cloth.